As much as I enjoy STRAPPING YOUNG LAD I always find myself enjoying THE DEVIN TOWNSEND BAND more. It is something about the way Canada's resident musical genius wraps beautiful melodies around layers of soulful wisp and intense emotion. Much like "Accelerated Evolution", "Synchestra" takes repeat listens to fully absorb. However, there is more of an immediacy with the new opus, a result of melodies that are bit more out front on many of the songs, whereas "Traveller" (a song I adore) from "Accelerated Evolution" seemed to stand out as the most accessible one of the bunch. Yet the album is still as progressive as they come. 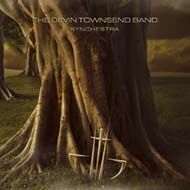 As Townsend readily admits, "Synchestra" stands in stark contrast to SYL's "Alien" (even more so than previous DTB efforts) for its uplifting and generally happy aura. At 65 minutes, there is much to digest on "Synchestra", but once you've made it past the first couple of spins it is easy to become swept away and stay for the entire ride again and again. On "Synchestra" especially, the effect of DTB's grand compositions is one that blocks outside stimuli from entering your psyche; it is THAT moving. Beginning on a serene note, "Let it Roll" is a wonderful acoustic piece with an Irish folk element and smooth keyboard background. Townsend's vocals on the song are the epitome of heartfelt. When the drums come in just after the two-minute mark, one senses the greatness to come. The acoustic picking that begins "Hypergeek" ultimately gives way to those familiar Devin sound explosions, this time with a hint of RUSH. The steady chug of "Triumph" (featuring a Steve Vai solo) begins the formal part of the trip, the seven-minute song building brilliantly; explosive and melodic, it is simply perfect. Then out of nowhere comes a banjo picking section (hey, it's Devin we're talking about here) before those soulful DTB waves begin crashing on the shore again. What a fantastic track. The next three songs are album defining. "Babysong" swoons and sways, the tinkling of the ivories (an element more noticeable throughout) like flakes of snow falling upon the earth. Quirky and fun, visions of dancing circus monkeys flow out of the brief "Vampolka" before a chugging guitar leads into one of the album's best songs "Vampira". The track is gloriously nutty with great hooks and cascading keys combining to make the event a most memorable one. 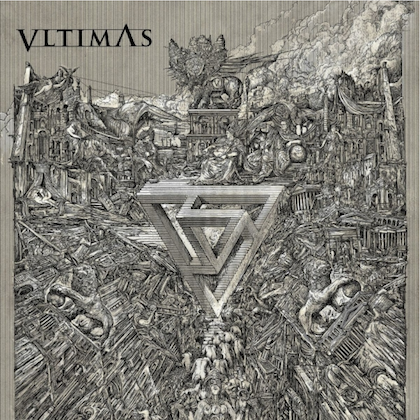 Moving through the remainder of the album, the music ebbs and flows from the chugging, hook-laden rocker "Gaia" to the eight-minute epic "Pixillate" to the mellower fare of "Judgement". A couple of minutes of experiencing the sounds of the rain forest on formal album closer "Notes from Africa" brings the adrenaline back down until a fantastic hidden track hits. The tune is purely boogie woogie rock and roll (done Devin style) that recalls something that CHEAP TRICK might have done. Though not included with my promotional copy, the album also includes a special edition bonus DVD called "The Devin Townsend Band Live", a 74-minute treat I'm sure. What more could you ask for?